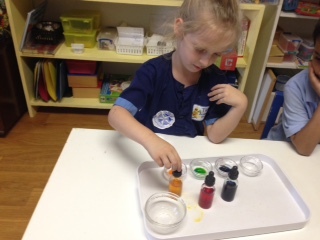 Our preschool days are busy with various activities. Our mornings begin with Sadhana class. Sometimes we go on Harinama, chanting Lord Krsna’s Holy Names around the temple community, accompanied by musical instruments and feeling delighted; sometimes it’s a more solemn Japa walk. 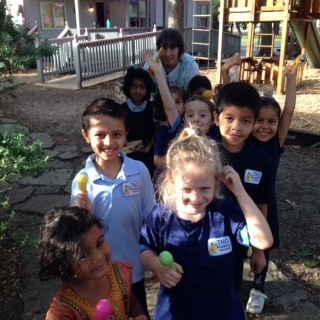 We also learned many stories and a song about Srila Prabhupada. 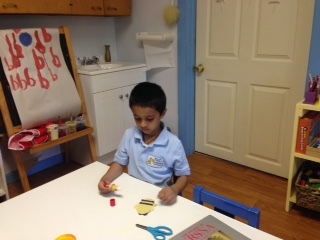 During art class we made necklaces for Srimati Radharani and a drum to accompany our chanting of “Radhe Jaya Jaya Madhava Dayite”. In Language Arts we covered the first letter cluster. 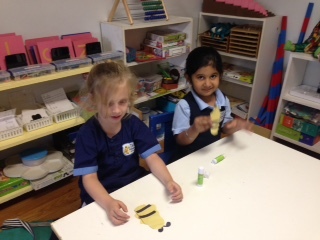 We made a snake and sun for ‘s’, a mouse and monkey for ‘m’, an alligator and apple for ‘a’ and a turtle and tiger for ‘t’. For the math session we made a chart with the numbers 1-10, and decorated them with the matching number of sequence. We learned about the different types of coins and played pretend Bakery. In science we learned about various land forms. We also made a book on the senses, describing their use and how they can be engaged in the loving service of the Lord Sri Krsna. 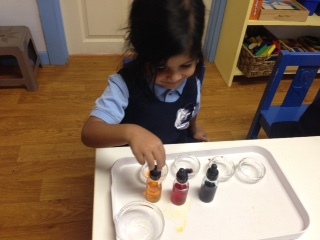 We also learned about the three primary colors and how we can mix them to create other colors. In Social Studies we focused on the differences between rural and urban communities and created a display of the typical characteristic of each.